It’s Neat and Tangled’s April Release Week. Today we are showcasing the NEW To The Stars stamp set. Make sure you (CLICK HERE!) to visit the Neat & Tangled blog for more inspiration from the rest of the design team. The NEW April release will go live on Friday at 8 AM. 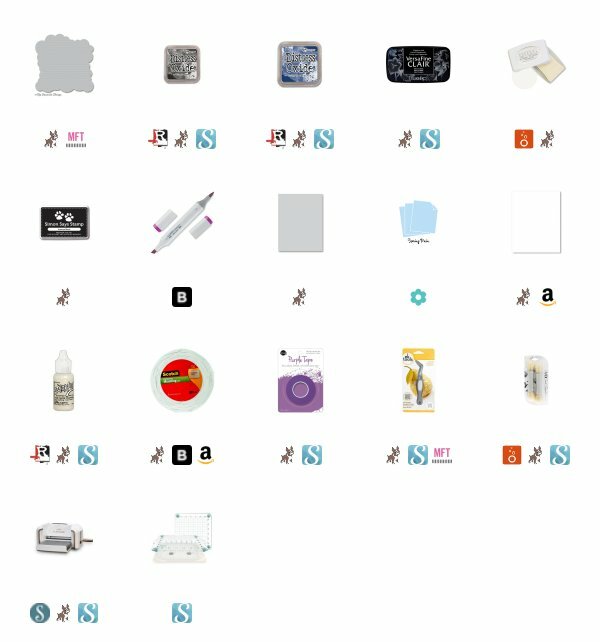 Make sure you comment across all of the blogs on the design team, for your chance to win a To The Stars stamp set of you very own. I started my card project today using a piece of Spring Rain card stock. I then used Distress Oxide Ink, in Black Soot to add some clouds, using the MFT cloud stencil. I also added in some Chipped Sapphire, but not very much. This panel was cut to 3 1/2” x 4 and 3/4’’. I used my We R Memory Keepers Precision Press to align the sentiment “Hello Beautiful” and stamped it using Versafine Clair Nocturne Ink. To do this I, did have to cut the sentiment into two pieces. I do this all the time, you can easily go back to stamping this the way it was intended, by just the lining them back up next to each other. While having my stamping tool out, I stamped my images using Simon Says Stamp intense black ink. I also colored them using my Copic markers. 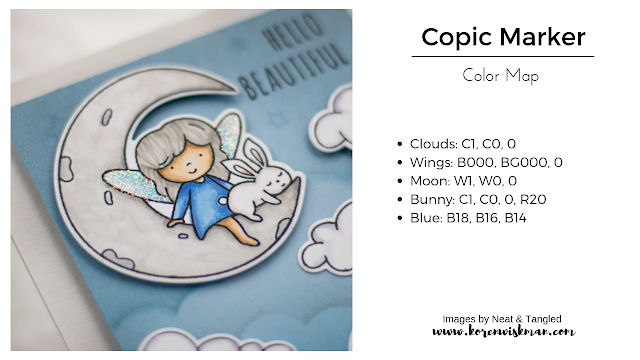 Below, I have a Copic Color Map listing all of the markers that I used to color my images. The cloud panel was added to a Simon Says Stamp Fog card base. I used white craft foam and Scrapbook.com double-sided adhesive to do so. I then adhered the rest of the images using Tombow Mono liquid adhesive or Scotch 3M foam tape. To add some additional interest to my card, I added Unicorn Stickles to my fairy’s wings. I also stamped three of the stars from the same Neat & Tangled "To The Stars" stamp set using Nuvo Clear Mark embossing ink. I wanted it to leave some tone on tone stars up at the top of the card, near the sentiment. This is hard to see in the photos. If I made this card again, I would use a darker ink in a similar blue shade, to make it stand out even more while still remaining subtle. 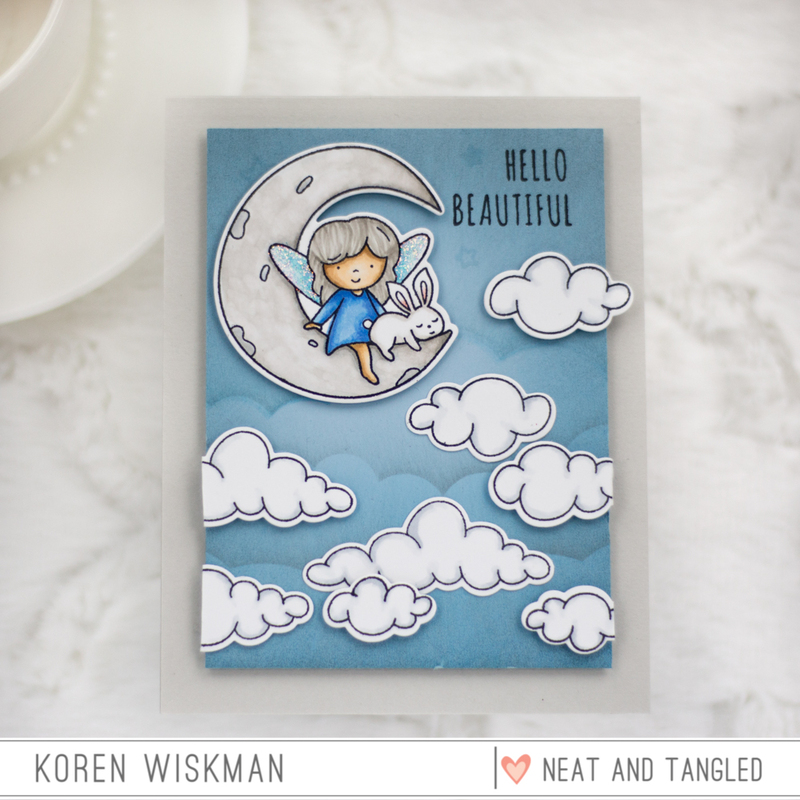 I hope you liked my card project today featuring the NEW To The Stars stamp set from the Neat & Tangled April release. This release will go LIVE on Friday at 8am.